THE SMITHSONIAN WATER/WAYS EXHIBIT at EUDORA! COME JOIN US AT THE OPENING of the SMITHSONIAN WATER/WAYS EXHIBIT at EUDORA! 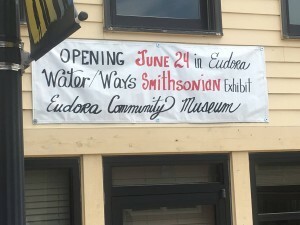 Join us for the dedication and Grand-Opening Ceremonies celebrating the arrival of the traveling Smithsonian Museum’s “Water/Ways” exhibit at the Eudora Community. Eudora Community Museum at 720 Main St., Eudora, KS. Please join us for the ribbon-cutting ceremony, short speeches, the first tours of the “Water/Ways” exhibit on our newly rehabilitated 2nd story, and free refreshments. This will be the first time our new addition and second story are open to the public. 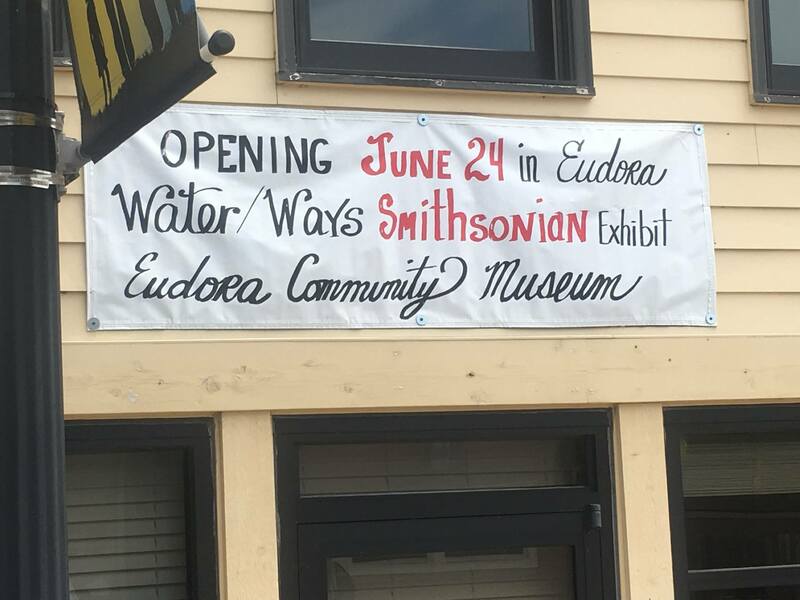 Eudora has never had an opportunity like this before, you don’t want to miss seeing the Smithsonian in Eudora! If you can’t make the grand opening event, the exhibit will be at the museum until August 6th. The museum will be open Tues.-Sun. from 10am to 5pm. “Water/Ways” focuses on the numerous relationships between people and water. How has water shaped our history and traditions? How does it impact our daily life? What does the future hold for water? We have also develop a companion exhibit to “Water/Ways” that relates to the history of water and Eudora. The companion exhibit will have a focus on the Kansas River in Eudora and the devastating 1951 Flood.